A t 5 am last Monday morning, a neighbor was shouting urgently outside our window, “Adam! Adam! The boat!” I rolled out of bed in the early morning light and walked to the back porch to look out at the ocean where our boat was parked, not sure what I was going to see, not sure what the urgency was all about. In fact I saw nothing, no boat at all, just a lot of huge waves smashing into one another. Having just woken from a deep sleep, it was hard to get my mind to accept that there was nothing where our boat should be. Our neighbor pointed far down the beach, “There! It’s broken!” And there was our boat about ¼ mile away, rocking on its side as heavy wave after heavy wave crashed it into the sandy beach, just a hundred feet or so from some big rocks. 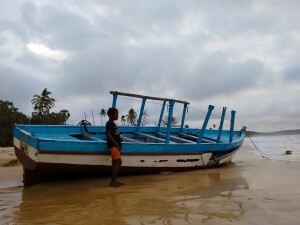 Our boat wrecked on the shore last week. In some ways, this was the culmination of months of challenges and struggles for Lora and me, with this final blow waking me up at 5 am that morning; one more thing to drag us under. And in one key way, it was the final release of burdens we’d been bearing for a long time, a weight lifted from our shoulders. I’m finding a lot of common understanding with Paul’s story of storm and shipwreck in Acts 27. If it’s been a while since you’ve read that, go ahead and do so now in order to follow along with what I’ll write later. So let me explain. 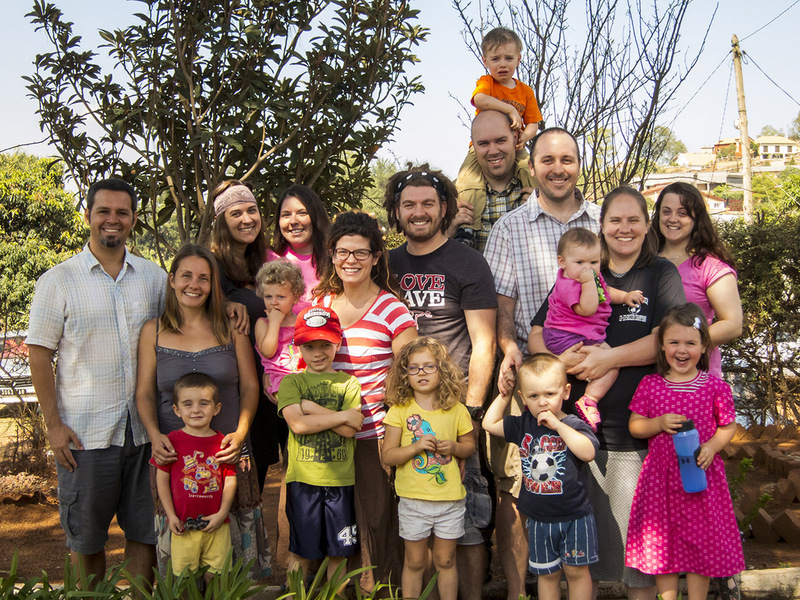 I believe you all know that for Lora and me, this is our first time to prepare for and lead a missions team, and this team is all new missionaries (with their numerous young children) among a resistant people group in a physically challenging location. We came into this with full faith in God’s calling and the determination and endurance to do what must be done to fulfill his calling. After all, when God calls you, he equips you. We were ready! Though frequently surprised by a multitude of obstacles along the way, alone accomplishing a task we’d never done nor participated in before, we invested an incredibly tiring year and a half successfully preparing for our team: providing them with newly built and fully-furnished homes, acquiring a team vehicle and learning how to operate it, communicating needs and expectations to them before arriving, preparing the details of their training program, and paving their way relationally into the communities which would receive them. Many of the challenges and surprises we faced during that time brought us near to exhaustion, but we pressed on and we finished (the first lap of) the race. We were ready! 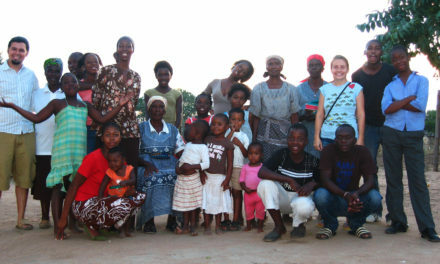 Our team in Tana a couple days after they first arrived in Madagascar. 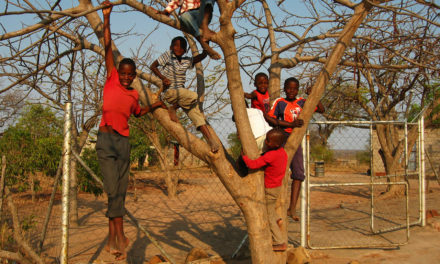 So when our team arrived, we continued to invest into them as heavily as we ever did during our preparations for them. We wanted to give them everything they needed to succeed! Soon, we found out that our desire to meet their needs, make them happy, and lead them through the adjustment process and their training program required an even more significant investment, day after day after day, than we’d already done during set-up for them. We were tired, but we pressed on. E arly this year is when I believe the “storm” really started. One of our team members faced a very serious problem and Lora and I tried everything we could, made every effort we could think of, to help bring her through it. For several months we tried and struggled with her (on top of all of our already tiring duties as team leaders), exhausting ourselves in every way we knew in an effort to bring clarity and resolution to the situation. But in the end, she went home to the US. The storm winds had pressed us somewhere we never expected to go. 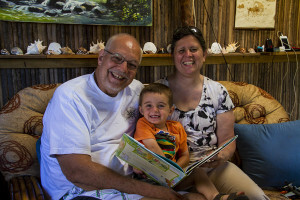 My parents enjoying time spent with their grandson in our home on Nosy Mitsio. Around the end of that time of losing our team member, Lora and I were eagerly making preparations to receive my parents for a visit to Madagascar. It had already been over two years since the last time we’d seen any family members and we were looking forward to a short break from everything we’d been struggling in. Everything about life here is so different from the US, that we were excited about the thought of sharing it with those we love, to find a bit of mutual understanding through mutual experience. But even there, a new problem arose, one that threatened to completely ruin the time we’d been so eagerly anticipating. For weeks we struggled as well as we could to overcome it, becoming more disheartened every day. This was the bit of light in a dark time that we’d been looking for, and even it was closing up to us. Finally, we pushed through, my parents arrived and we all enjoyed the time together. But the anxiety of having almost lost that opportunity didn’t completely go away. 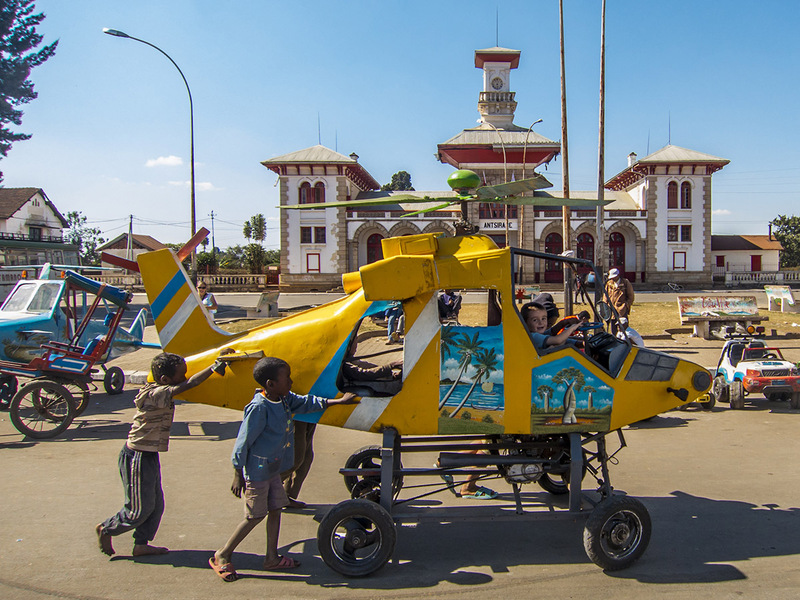 The last picture I took with my camera, Matimu enjoying vacation in Antsirabe. 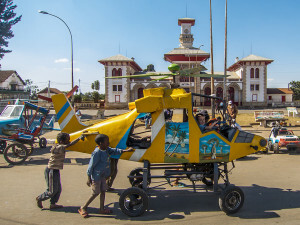 Next, we spent some time in Madagascar’s capital city, Tana, where we hoped to get some rest and prepare for the next unit of our team’s training, while our team members were in Kenya for their own vacation and organizational training. Almost the first day in Tana, someone stole my phone on the bus. I lost my contact numbers and “to-do” lists of all the work I needed to do. A disappointment, but not too huge. A week later, when we were getting a week of vacation, my camera broke. That was a bigger disappointment, as replacing it would be more costly and more difficult, and it was really an awesome camera. As the weeks wore on, we stayed busy preparing our team’s training, realizing we wouldn’t really get the break we’d hoped for. 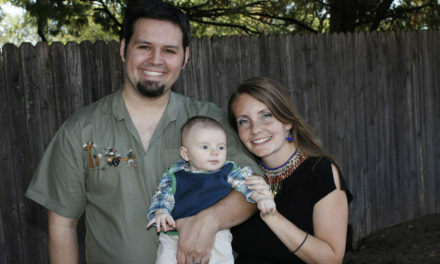 But we were content that what we were preparing for them would make them successful as missionaries here. Then my laptop’s power adapter began failing, causing me to repeat some of my work. Then my hard drive itself failed, causing me to lose a LOT of my work! (Though, thank God that it wasn’t until after I’d uploaded most of the new unit’s training to the internet.) Each of these problems alone were a disappointment, but not too bad as we don’t hold too tightly to our material things. Yet having all of this at once made me realize how hard it really was to handle! We started wondering if the Enemy was out to get us. 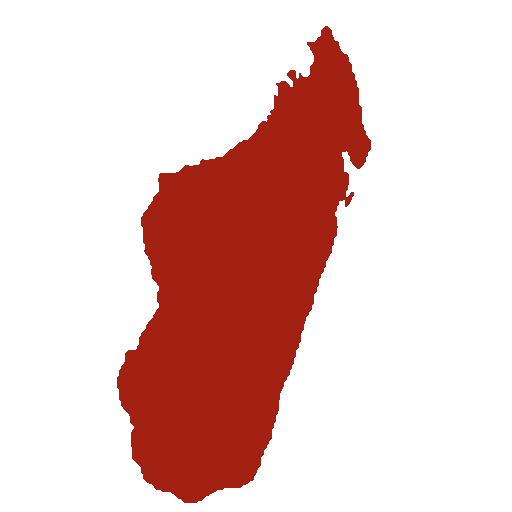 S oon, our team returned to Madagascar. 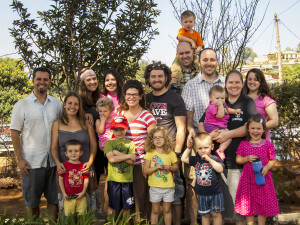 We were very excited to have them back, and even more excited about the transitions ahead for them – about them taking on more responsibility and growing more fully in their roles as missionaries. And most of all, about the prospects of officially beginning ministry to the Antakarana soon – the very reason we’d been working ourselves so hard for years now! But right after getting back to Nosy Mitsio, things started falling apart. This is where I’d say the storm hit us hardest. Right at our home, and from a direction we never expected. Lora and I began to break apart from the smashing waves all around us. We knew that many in the team were experiencing heightened stress, and why wouldn’t they? It’s a stressful job, and we as team leaders, in working them through their training program, have to increase their stress at pre-determined times – that’s the natural result of increased responsibility and tighter accountability. And working so closely, and without strong distinction in personal and professional life, means personality differences become harder for people to handle. Our old methods of doing everything we could to meet our team members’ needs, to make them happy, to lead them through their training program, just didn’t seem to be enough anymore. That’s an understatement. A couple team members, highly stressed themselves, made it very clear that what we had done for them wasn’t enough, that it was never enough. For a time, Lora and I thought we were failing every team member, that we couldn’t lead them, that they didn’t want us to. We tried to respond quickly, to readjust roles and expectations in a way that was manageable. It wasn’t enough. All through the night, the storm pounded us violently. The next day, the crew threw the ship’s cargo overboard; and the day after that, they discarded any of the ship’s equipment they could do without. Days passed without relief from the furious winds, without a single break in the clouds to see sun or stars, even for a moment. Despair set in, as if all hope of rescue had been cast overboard as well. One of the first boat trips we took after moving to Nosy Mitsio – rowing to the mainland at night in a full boat with no motor and no winds to blow the sail. Lora and I felt exactly like that. We tried to bail the boat, to dump off any extra roles or efforts that just weren’t getting the job done, and still there was no hope to be seen. What I can really say is that our perspective had narrowed drastically, there wasn’t much light to see by, and we thought we were at the end. We seriously considered quitting on our team and began to discuss how soon we could do it; many times we were just a day or two away from it. Unlike Paul in this story (because we certainly were not demonstrating the sort of faith that he has), we were the crew that (in verse 30) decided to make a run for it on our own. We did know, like Paul, that if we abandoned ship, our team would sink as well. But we were at the end and didn’t know what else to do. If it weren’t for a few encouraging and very well-timed e-mails from friends/supporters back home, to remind us that God was thinking about us and taking care of our needs, we might have indeed reached the end during that dark time. T hankfully, we did have a sort of Paul figure in our life, one of our regional leaders that we were able to speak to on the phone, who encouraged us and gave us the bigger picture. 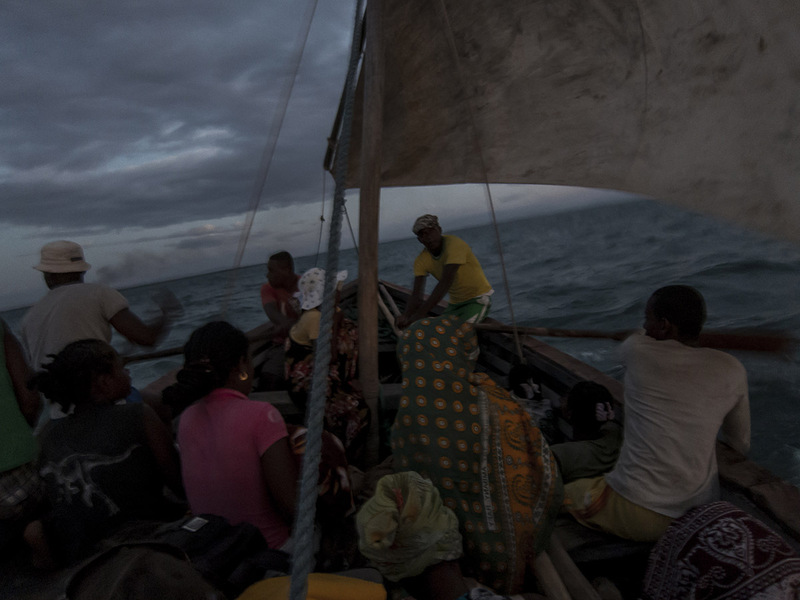 He himself was on a boat being battered by waves and some of the larger ones were washing the crew overboard. Much of the missions work in our region has been under attack lately, especially by divisiveness and disunity, and just the week before, another new missions team in our area had succumbed – all but one team member went home. This wasn’t a storm against us alone. Though we were caught in the middle, it was an effort by the Enemy, by all means (especially those hardest to bear) to prevent God’s Kingdom from spreading in these areas where it’s not yet been established. And like Paul spoke to the crew of the ship (in verses 33-38), we received some paradoxical advice that was what saved us. Rather than fighting the winds and the waves, the attack we were facing, rather than continuing with our failing efforts to save our team and ourselves – instead it was time to take our bread, our sustenance from God, and throw out all our efforts, all our trying, to lighten our load by throwing out everything we think we need, and trust in God to run us aground safely. In verse 39, the day finally breaks after “14 days of incredible stress.” For us, it was a time of finally seeing the light, some hope ahead. We led our team in a week set aside for prayer against the attack we were facing. It was a time for all of us of rejecting nearly all our duties, of submitting ourselves to God, of trusting him to meet our every need, and of tossing around in the winds and waves with him as we waited for him to set us safely ashore. T he last day of that week of our team’s dedicated prayer, the west wind started early and blew hard. It’s a very unusual occurrence during this time of year (usually you can expect the opposite). It picked up speed throughout the day and all through the night, smashing waves on the shore, with our boat bouncing around on its heavy cement anchor out in the ocean. I was worried about the boat, but there was nothing I could do – too late to reach the boat and too late to move it. During the early morning hours, our boat had taken on enough water that it was heavy enough for the wind and waves to drag it (heavy cement anchor and all) all the way to shore and smash it against the beach. At first light, a neighbor saw it and woke us up. Down on the beach it was filling with sand carried in by the waves; it had several broken and missing boards, a bunch more popped out of place, and a half dozen cracked ribs. It’s definitely not seaworthy right now. The damage to our boat after it wrecked last week. If we hadn’t spent the previous week with God, lightening our load by tossing all our needs and our efforts overboard and trusting utterly in him, then that boat wreck could’ve really wrecked us. We were certainly ravaged enough by the storm already and that would’ve been the last of us, sinking under the pounding waves. But instead, it was like the end of Paul’s story in that chapter: a final act of trusting God, of cutting our last safety lines, of smashing what was left against the rocks, and letting God carry us to shore. 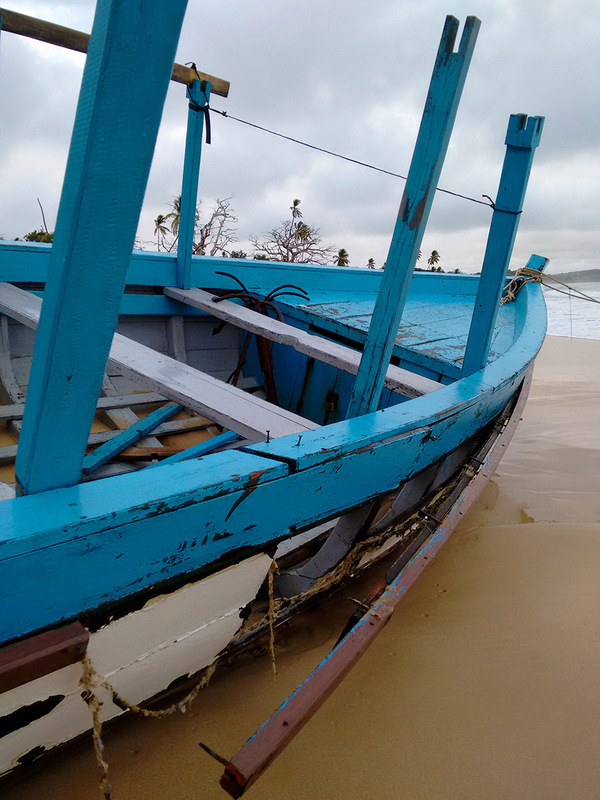 As I stood in the waves and surveyed the damage to the boat early that morning, I gave it up to God, and I knew that he was taking care of us. The last of our burdens had been cut loose. As the team met later that morning and we discussed our week of prayer, we found that God had taken the time to speak to all of us, to give us that greater perspective we each so desperately needed, teaching all of us to rely on him more fully, and in so doing, to overcome any storm or attack the Enemy could send our way. 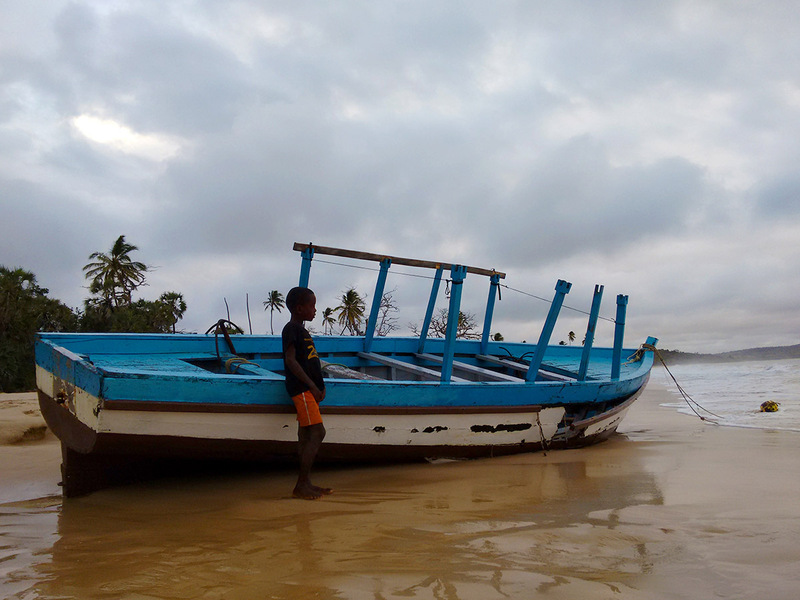 Just like Paul, being washed ashore after this storm doesn’t mean no more bad will come to us. In fact, I think it will. (Just read the following chapter in Acts.) I don’t believe the Enemy has given up on attacking us yet. Maybe we’ll be taking care of some basic need, like warming our hearts after a troubling storm, and some snake will come out to bite us. But if we keep our eyes on the one who directs our path, if we trust in him instead of our own efforts, then I believe no lasting harm will come to us from the Enemy, and God’s Kingdom will spread and it will prevail. Endure trials for the sake of discipline… Now, discipline always seems painful rather than pleasant at the time, but later it yields the peaceful fruit of righteousness to those who have been trained by it. Therefore lift your drooping hands and strengthen your weak knees, and make straight paths for your feet, so that what is lame may not be put out of joint, but rather be healed. P.S. Currently we’re working on plans to have our boat repaired. Two team members are taking the lead on this and doing an excellent job so far. I just got news over the phone that they’ve found a carpenter at the Port who is willing to come out to Nosy Mitsio soon to fix our boat here on the beach. Maybe even within a few weeks, it’ll be seaworthy again. Just in time for our team to travel back to the mainland. Praise God whose plans are never late! 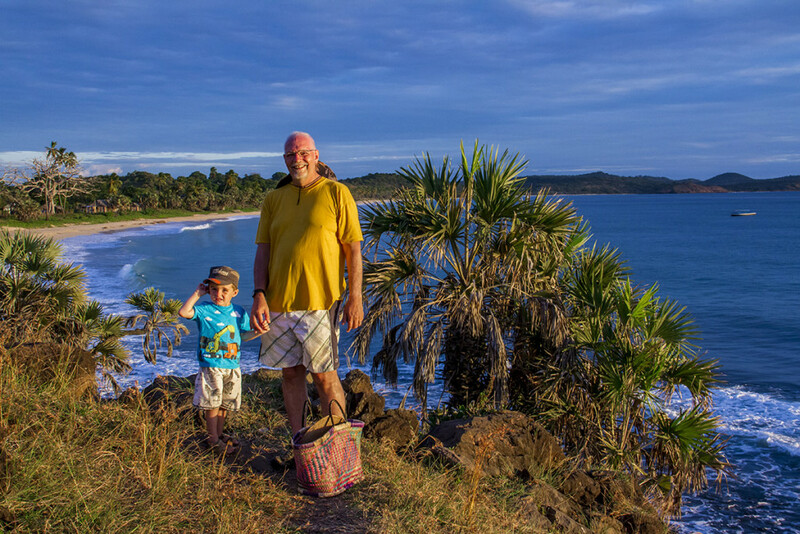 My Dad and Matimu on a hill above our village on Nosy Mitsio. You can see our boat parked out to the right, how far it’s usually parked out in the ocean. We’re certainly chocked with what’s been happenning with you guys and we understand all the stress, anxious, and struggles…as you are facing the reality. Know that we are in your side and pray for you.We all know that God is always in control and everything He has created is in His mighty hand. However, we do not stop to sak His mighty protection, faithful provision in every area of your life and all powerfull and supernatural comfort and energy upon you guys. You and your family and your faithfull team.We pray That God will provide all the needs for new boat for you and wisdom strong faith and energy for you. That people in the Nosy Mitsio will be revealed that God is alive and with you. With all our Harmony, love, prayer, and thoughts. Thanks for the update!! So good to see how the Father is working in your lives. I always love reading them and asking God how exactly to pray over you all. Praying for you guys and for Lora as she grows with pregnancy 🙂 We are so excited for the new baby in December! !